PT Kereta Api Indonesia (Persero) - KAI or referred to as "KAI Group" is a leading state-owned company in Indonesia, running business as railways operator in Java-Bali and Sumatera regions. 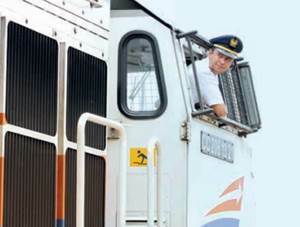 PT Kereta Api Indonesia (Persero) is a non-listed state-owned company and is 100% owned by the Government of Indonesia. Based in Bandung West Java, KAI Group now has 9 Operation Area Offices (DAOP), 3 Regional Division Offices (DIVRE), 3 Sub Regional Division Offices (SUB-DIVRE), 5 Balai Yasa spread across Indonesia (as of December 2015). The Company also supported by a total of more than 25,361 staff. PT Kereta Api Indonesia (Persero) has 6 key subsidiaries; namely PT Kereta Api Logistik (99.90% owned by KAI Group), PT Kereta Api Properti Manajemen (99.90%), PT Kereta Api Pariwisata (99.90%), PT KAI Commuter Jabodetabek (99.78%), PT Reska Multi Usaha (95.01%), and PT Railink (60%). Male / Female, maximum age of 25 years old as of 1 February 2017. Minimum height of 160 cm for Male and 155 cm for Female (weight porposional). Single/not marrted as evidenced by a Certificate Not Married by Village Office and willing not to get married during the contract period. Senior High School (SMA) or equivaent : minimum average diploma score of 70. Diploma or Bachelor Degree (D3 / S1) : minimum GPA of 2.95 with minimum accreditation "B". Fluent in at least two languages (Indonesian and English), both oral and in writing. Have a good health (physically and spiritually) as evidenced by a from a medical certificate doctor and a drug-free information and not colorblind. A letter of good conduct from the police (SKCK), health certificate, diploma / transcripts, certificate(s). JobsCDC.com now available on android device. Download now on Google Play here. Please be aware of recruitment fraud. The entire stage of this selection process is free of charge. PT Kereta Api Indonesia (Persero) - SMA, SMK, D3, S1 Fresh Graduate PKWT Staff KAI January 2017 will never ask for fees or upfront payments for any purposes during the recruitment process such as transportation and accommodation.